ZeroVector - i made a shmup! i love playing shmups on the iPad and have wanted to try making one for a long time. i finally got around to creating one and it's available now on iOS, Android, and Fire OS! download it for some fast arcade fun - it's free! the game is a retro vector-display-style endless vertical space shoot'em up. you shoot down enemies in a series of waves with boss battles every 8 and the game gets harder and harder until you die. (just like real life!) you have three lives to amass the highest score you can. there are leaderboards for score, survival time, and number of waves so you can compete with everyone else in the world and see how well you can stack up. in addition there are items that drop as you kill enemies. shields protect your ship from incoming bullets. EMP lasts three seconds and zaps all enemy bullets converting them into bonuses for you. bombs do instant damage to all enemies on screen and clears enemy bullets. you can stack double shields for deflector and stack double EMP for lightning attack. the items make it really fun and keep things fast paced and exciting. the enemy waves are procedural so each play through is a bit different. after each boss battle the play field changes and gets more colorful and busy helping to increase the difficulty as you progress. i made it free so everyone who wants to can grab a copy and play with it. if you like it you can remove the ads for $1. and if you really like it you can buy me tacos in the store and help fuel future updates and additions! there's still lots with the game i'd like to add and improve. i tried to keep things pretty simple for the first version. i think it'll be fun to add more bosses, new enemy types, achievements, and a campaign or unlockable missions. if you think of something fun you'd like to see in the game let me know! i went to the M+DEV game development conference over the weekend. i had never driven up to wisconsin before and it turned out to be a really fun trip. anyway, the conference itself was like a mini GDC with a small exhibit area and lots of talks broken into several paths for different disciplines. the opening keynote was given by Warren Spector and was excellent and very inspirational. there were lots of interesting people to meet from companies in wisconsin and also the chicago area. this past week SketchClub was part of Apple's "Unleah Your Creativity" promotion in the App Store! it was featured on the front page of the App Store worldwide and on sale too for the Chinese New Year celebration in Asia. it was super cool to see the app and art by SketchClub artists SKYW4kR and Wendy promoted in the store and on social media. fun start to the new year! so it's been a year since i moved to my new house already! moving was such a pain but it's been nice since everything is done. i probably visited with my family more in just a few months than in the past 10 years combined. my cats took some time to get used to the new place and divide the territory between them, but they've settled in nicely by now with their own favorite areas. there are side windows by my front door which go down to the floor and Scratchy likes to watch the neighborhood from there. when the UPS dude drops something off Scratchy comes to find me and let me know. Storm has found several choice spots for sun bathing and has taken to alternating between office chairs for her bed. i also have two new pets now. i hatched these crazy chickens from eggs! that's Squeaky on the left and Dracula on the right. they turn out to be really nice pets and are super tame. 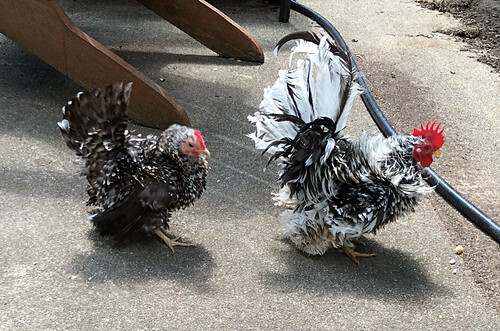 i kept them in the laundry room during the winter and in summer they've been outside in a coop. i've gotten into a nice morning routine of getting up and letting the chickens out of their coop to run around while i make pancakes or eggs and eat outside with them and a book. i've got two offices set up, one with an iMac and one with a PC. i gave away all my desktop computer stuff before moving so it was fun to build a new PC for the new house. i mostly code on my laptop and pick an office based on which one Storm is sleeping in that day. the PC has been great for gaming (lots of VR, DOOM, and Overwatch) and monkeying with cross platform stuff with PaintBot and other experiments. there i was just minding my own business when from some forgotten corner of my mind INFINIMEX called out to me once again. 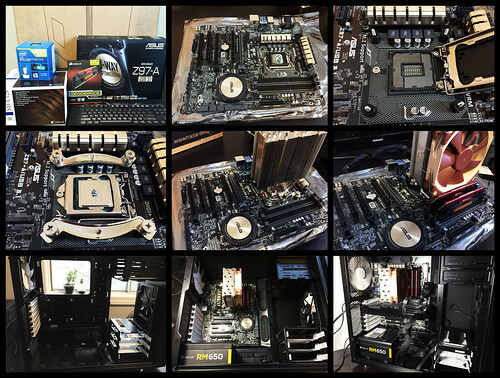 so this past weekend instead of writing a novel or sorting my sock drawer like a normal human being would do, i set out to work on some upgrades for it. i rewrote most of it making it more general so it can splat new content wherever i want and automatically determine what region is available for cutting through based on current contents, patch size, and how many laplacian pyramid blend levels are being used. this got rid of some sneaky seams the old version had and made the code simpler too. with its new found skills it made sense to go beyond scrolling and take things to the next level with some infinite zoooooom! one of my goals last year was to ship PaintBot... well i didn't make it. turns out to be quite difficult wrapping up a fun little experiment into a finished product. i went through a bunch of iterations on the user interface - bouncing a few times between being too simple to get enough control over the output to being too complicated to expect any casual user to bother exploring. i think it's pretty close by now though. then again i still have lists of like 100,000 experiments with it i want to try. 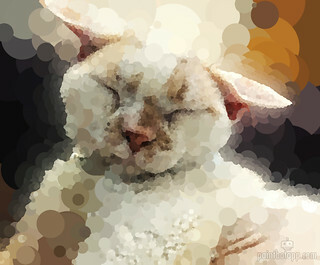 :) here's one where PaintBot could only use circles. i've been loving the iPad Pro! the speakers are fantastic. maybe it's because with the screen being bigger they are farther apart or perhaps magic from how they distribute sound between the four speakers but you can really hear stereo effects nicely. it sounds amazing in movies and games. the pencil is great. you unplug the non-pointy end to get a lightning connector you connect to iPad Pro to pair and charge. like other styluses though it is pretty easy to lose. a find my Pencil app like the find my iPhone app would be nice. iOS handles the palm rejection and it's pretty much perfect. this is a really great change from other styluses where it was up to each individual app to handle palm rejection and things were never quite perfect. the pressure response is great. one interesting thing is the scale of pressure values is from 0 to 4 with 1 being "normal" pressure. this is unlike other styluses that always normalized pressure to the 0 to 1 range. i've found you have to press crazy hard to get anywhere near 4. the tilt is great too. it's taken me longer to get a Sketch Club update out for it than i had hoped. i've done a pretty extensive overhaul of the internal brush system. not just to support Pencil and all the iOS changes around coalesced touches, predicted data, precise locations, etc but also for a ton of new features for the 2.2 update and for sharing brushes with PaintBot and some future apps.